This blog post was written by Megan Ma, a Student in 2017 Fall Semester of Harvard Law School’s Public Health Law and Policy Seminar. A noticeable similarity across three discretionary programs – The Ryan White HIV/AIDS Program, Title X, and Veterans Affairs is the sentiment that such programs, while helping to serve the health care needs of vulnerable populations, continue to project federal control, rather than federal support, over the decisions of such groups. The federal restraints limit the populations that rely on these programs from truly attaining access to health care they need. These three discretionary programs illustrate that vulnerable groups are either threatened with sizable budget cuts, program and coverage constraints, or altogether elimination. It is puzzling that the health care system, despite having made good faith efforts to serve the underserved, continues to disproportionately benefit those who are wealthy. When health care options available are not the same for everyone, regardless of income, health care becomes a good, not a right. This communicates the stark message that not everyone deserves the same access to quality health care. I consider that health care and more importantly, access to health care, is continually perceived in Congress as a privilege rather than a right. These programs historically offered (and intended) to care for the specific and sensitive needs of low-income and young women, HIV/AIDS patients, or veterans. Such groups have benefited greatly from these programs: young women have been educated and empowered to take control of their bodies, HIV/AIDS patients have attained medically necessary treatment, and veterans have accessed critical support to transition from their time on duty. Unfortunately, with the expansion of the Affordable Care Act, policymakers are finding reason to slash budgets as if provision of health care through these programs is a simple matter of dollars and cents. I was perhaps most appalled to read that allegedly the severe backlog of patients led to treatment delays that caused the deaths of nearly 40 veterans in 2014. More importantly, the incentive structure (in the form of a cash bonus) for VA hospitals was failing. If hospitals place patients on a “secret list” to evade scrutiny, rather than actively innovating policies to reduce patient wait times, there is an evident systemic issue. 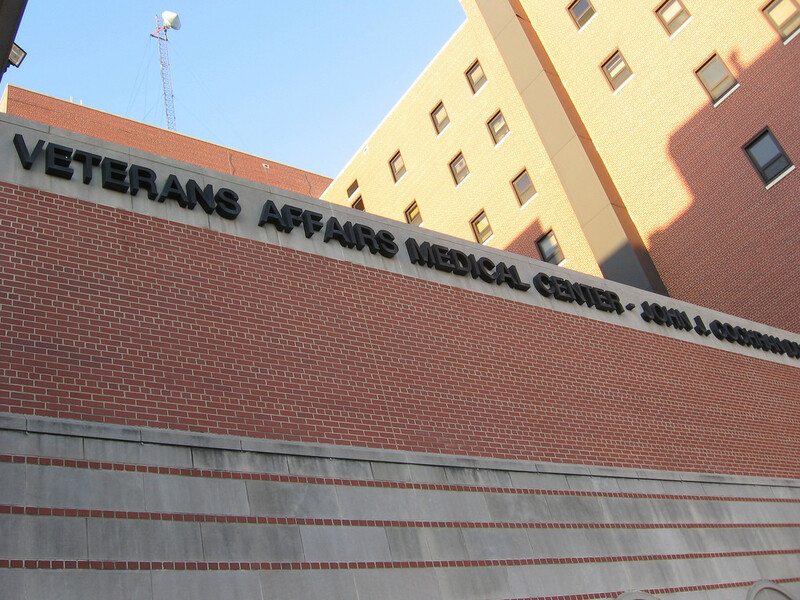 Veterans Affairs also has a budget comparable to a Fortune 6 company, illustrating that the issue is not shortage of funds, but that a systemic reform is past due. This again reiterates that classic market forces do not work well in the provision of health care. Originally published by The Harvard Crimson on Monday, October 24, 2016. Written by Margot D. Dionne, Contributing Writer. Images via twitter. Dozens gathered at the Law School Friday to discuss the importance of nutrition and to consider how people can gain access to healthy food in the United States. 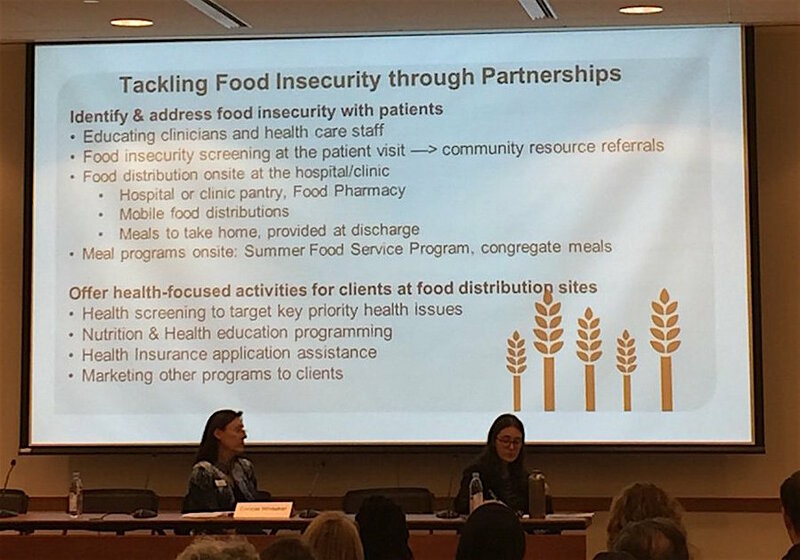 The Center for Health Law and Policy Innovation of Harvard Law School partnered with Community Servings, a nonprofit nutrition program in Massachusetts, to host the fourth annual Food is Medicine Symposium. The evening consisted of two panel discussions and a lecture from keynote speaker Timothy S. Harlan, the executive director of the Goldring Center for Culinary Medicine at Tulane University. The center is the first teaching kitchen opened at a medical school, according to the center’s website. “Food is medicine, and it plays such a big role,” Samantha L. Hooper, an executive at a public relations firm that works with Community Servings, said. 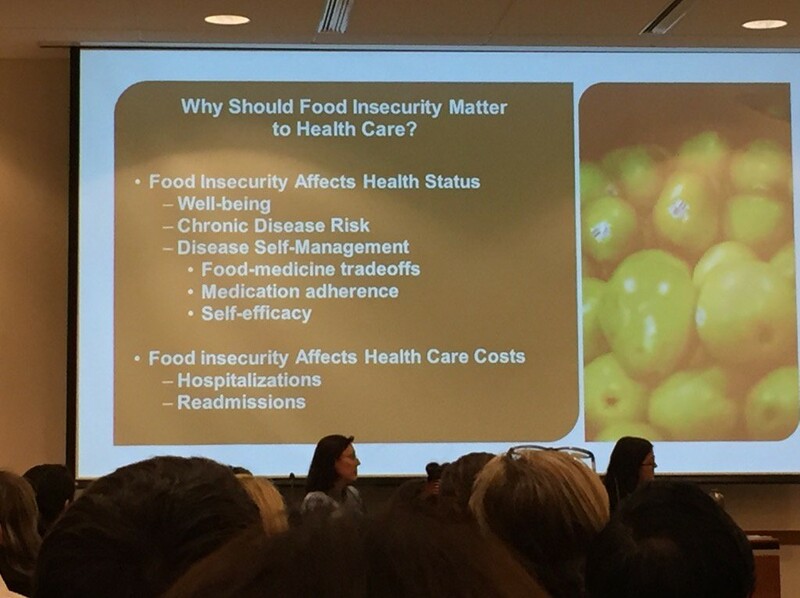 The first set of panelists discussed the role of food banks in solving the problem of food insecurity, the inability for people to consistently get healthy food. Kim Prendergast, a panelist from the non nonprofit Feeding America, said during the event that 12.7 percent of U.S. households are food-insecure. The second panel focused on medically tailored food, which provides adequate nutrition for people with dietary restrictions because of a chronic illness. Community Servings, which was founded in 1989 to provide food for HIV and AIDS patients, provides medically tailored food to about 1,100 clients with 35 different illnesses, CEO David B. Waters said. “I fell in love with the idea of feeding people who were sick and low income so I started at Community Servings when they were first founded,” Waters said in an interview after the event. Harlan ended the night with a lecture about nutrition and his role at the Goldring Center. He livened the crowd with jokes and anecdotes. “I changed the way I cook and became very interested in health in general,” Harlan said in an interview. About 100 people showed up to hear the panelists. Phuong Ho, a volunteer at Community Servings, said she enjoyed the event because it focused on an issue she cares about. Watch the recording of the Fourth Annual Food is Medicine Symposium. Government Support for Food Waste Reduction. Keeping Food Out of Landfills covers a range of exciting policy examples from all over the country, such as Virginia’s new tax incentive for food donors, California’s funding to support food recovery infrastructure, guidance by Indiana to help schools implement share tables and reduce food waste, and organic waste bans and waste recycling laws from New York City to Vermont. A variety of educational resources are included in the toolkit to encourage readers to expand their knowledge of ways to address food waste. Approximately 40% of the food produced in the U.S. is wasted annually. At a time when millions of Americans are food insecure and thousands of farmers struggle to stay afloat, the negative consequences of wasting food extend far beyond the environmental impacts and loss of resources that could have been otherwise allocated. FLPC hopes this toolkit will serve as a guide to creating systemic change that redirects food from the landfill to those who need it most. 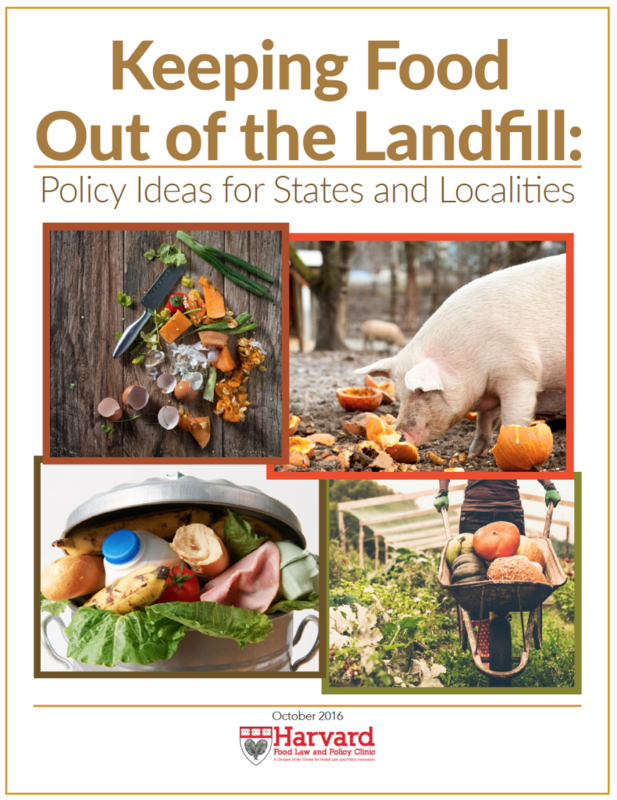 Read Keeping Food Out of the Landfill: Policy Ideas for States and Localities. The health law prohibits insurers from discriminating against people with serious illnesses, but some marketplace plans sidestep that taboo by making the drugs that people with HIV need unavailable or unaffordable, complaints filed recently with the Department of Health and Human Services’ Office for Civil Rights allege. The effect may be to discourage people with HIV from buying a particular plan or getting the treatment they need, according to the complaint. The complaints, brought by Harvard Law School’s Center for Health Law and Policy Innovation, charge that plans offered by seven insurers in eight states are discriminatory because they don’t cover drugs that are essential to the treatment of HIV or require high out-of-pocket spending by patients for covered drugs. The center filed complaints against Humana plans in six states: Alabama, Georgia, Illinois, Louisiana, Tennessee and Texas. Cigna plans were targeted in three states: Georgia, Tennessee and Texas. The group filed complaints against five other insurers: three in Pennsylvania, including Highmark, Independence Blue Cross and UPMC health plan; a complaint against Community Health Choice in Texas and a complaint against Anthem Blue Cross Blue Shield in Wisconsin. “What’s most important to us is that there’s a robust enforcement mechanism around the promises … in the ACA and its regulations, especially the anti-discrimination provisions,” said Kevin Costello, director of litigation at the health law center. Although the center’s focus is on HIV drugs, the complaints may help people with other chronic illnesses who may face similar hurdles on access to drugs, Costello said. The HHS Office for Civil Rights investigates and enforces violations of civil rights and health information privacy. The Harvard center complaints were filed in September. Federal rules prohibit marketplace plans from adopting benefit designs — such as coverage rules or reimbursement rates — that discriminate based on age, illness, race, gender or sexual orientation, among other things. But federal regulators have declined to define discriminatory plan design, noting that they will examine the facts on a case-by-case basis. Working with local AIDS groups in several states, the Harvard center examined hundreds of silver-level plans sold on the marketplaces to gauge whether their formularies would allow access to six treatment regimens that are the current standard of care for treating people who are newly diagnosed with HIV. In addition, they looked at the plans’ cost-sharing requirements, Costello said. They found, for example, that this year Anthem silver plans in Wisconsin cover only four of the 16 drugs or combination products that are recommended to meet the current standard of care, and they fail to cover any single-tablet regimens. In Illinois, the center charged that Humana’s silver plans place 16 of the 24 most commonly prescribed HIV drugs in the highest cost-sharing tier, which requires patients to pay 50 percent of the cost. With estimated monthly costs ranging from $377 to $684 for different drug regimens, enrollees in the Illinois Humana plans would have to pony up between 8 and 14 percent of their average monthly income, according to the complaint. Cigna spokesman Mark Slitt said his company does not comment on pending legal matters. The center’s work builds on an earlier discrimination complaint filed in 2014 with the Office for Civil Rights by two advocacy groups, the AIDS Institute and the National Health Law Program, against four Florida insurers that were selling marketplace plans. That complaint, against some of the same insurers highlighted by the Harvard center, charged that the insurers placed all the HIV drugs in the highest cost-sharing tier. The Florida insurance commissioner reached agreements with the four plans to move the HIV drugs to generic tiers and reduce cost sharing, and the same arrangement will continue in 2017, said Carl Schmid, deputy executive director of the AIDS Institute. “We’ve been talking about these issues for years now,” Schmid said. “These things need to be addressed, and it could be through enforcement” by the Office for Civil Rights. Marketplace coverage of drugs to treat HIV and other serious conditions have improved somewhat in recent years, according to research by Avalere Health, a consulting company. An analysis found that in the case of five classes of drugs that treat cancer, HIV and multiple sclerosis, fewer silver plans in 2016 placed all the drugs in the class in the top tier with the highest cost sharing or charged patients more than 40 percent of the cost for each drug in the class. Speaking about HIV drugs, Caroline Pearson, a senior vice president at Avalere, said that while access and costs in marketplace plans are improving, they vary widely from plan to plan. Employer plans tend to offer better coverage, she said. The new complaints may put more pressure on the Office for Civil Rights to address this issue, said Katie Keith, a steering committee member for Out2Enroll, a health insurance advocacy group for the lesbian, gay, bisexual and transgender community. The Harvard Law School Food Law and Policy Clinic (FLPC), in partnership with Racing Horse Productions, has released a screening toolkit for the short film EXPIRED? Food Waste in America. Expired? was released in February 2016 and explores how misleading date labels on food products contribute to food waste in America. By now, Expired? has more than 16,800 views on Vimeo. But this impactful documentary has the power to engage and inform millions on the critical issue facing the United States. With that in mind, FLPC has released a screening toolkit to encourage food waste warriors at every level to reach even more people. The screening toolkit contains helpful advice for preparing to screen the documentary for the public, discussion questions and talking points to get the conversation started, advice on how to take action to combat food waste and reform expiration date labels, and additional resources from other leaders in the food waste reduction movement. The U.S. alone wastes 160 billion pounds of food, or nearly 40% of food produced in this country, annually. 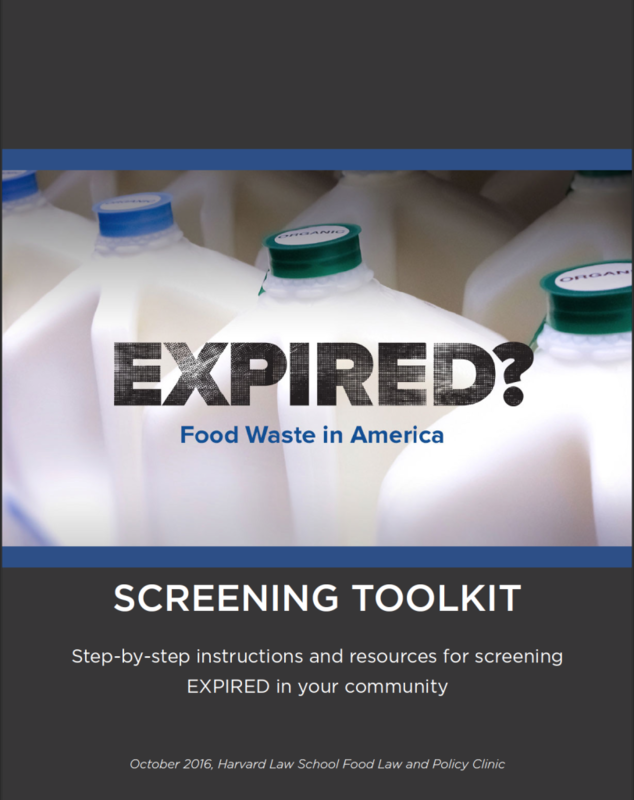 We hope the screening toolkit will encourage colleges and universities, high schools, libraries, food policy councils, health departments, advocates to hold screening of Expired? to help raise awareness on the need to reform our expiration date labeling system and reduce the amount of safe and wholesome food wasted in the U.S.
Download a copy of the Expired? Food Waste in America screening toolkit. What does that ‘sell by’ date really mean, anyway? Originally published by The Boston Globe on October 5, 2016. Written by Catherine Smart. It’s hard to know how to interpret food date labels. If it smells fine but it’s past the best-by mark, should you pitch it? And what does “sell by” really mean anyway? Professor Emily Broad Leib, director of the Harvard Food Law and Policy Clinic and deputy director of the Harvard Law School Center for Health Law and Policy Innovation, is on a mission to help decode the mixed messages sent by those puzzling stamps on our food. The professor was recently honored by Food & Wine and Forbes as one of the 20 most innovative women in Food and Drink for her work surrounding food waste. Through the Food Law and Policy Clinic, she helps provide guidance to farmers’ markets on navigating food sales, assists businesses that want to donate excess food in protecting themselves from liability, and tackles the issue of confusing food labeling. “Massachusetts makes it very difficult if you want to sell or donate past-date food. And then in certain cities, like here in Boston, they actually say, ‘We aren’t allowing it at all.’ The Boston Health Department has a blanket ban on any past-date food to be donated,” says Leib. “A big piece of our work is trying to make those laws better, because for so long we had priorities in our food system to make food cheap and accessible, and I think now there is a lot more attention being paid to food being safe and healthy and having good ingredients, and not wasting it,” says the professor. Leib says that research has shown that the most cost-effective way to reduce food waste in the United States is to clarify and standardize date labels. The professor points out that only a small handful of foods become dangerous to eat after a certain date. In the future, she hopes those foods will be clearly marked “expires on.” When it comes to quality, but not safety, Leib says surveys have shown “best if used by” is a term that shoppers understand.